Véronique Pagnier, Stanhope Press from Fontaine de Vaucluse, France, Creative Commons Share Alike (2011). One of the important leaps in the technology of copying text was the mechanization of printing. The speed and efficiency of printing was greatly improved through mechanization. This took several forms including: replacing wooden parts with metal ones, cylindrical printing, and stereotyping. The innovations of printing during the 19th century affected the way images were reproduced for illustrations as well as for type. These innovations were so influential on society because they greatly increased the ability to produce large quantities of work quickly. This was very significant for printers of newspapers, who were limited by the amount their press could produce in a short amount of time. One major step in improving the printing press was changing the parts from wood to metal. Although many other inventors were part of innovations which led up to the metal printing press, Charles 3rd Earl of Stanhope was the first to succeed in creating a machine made of metal in 1798. 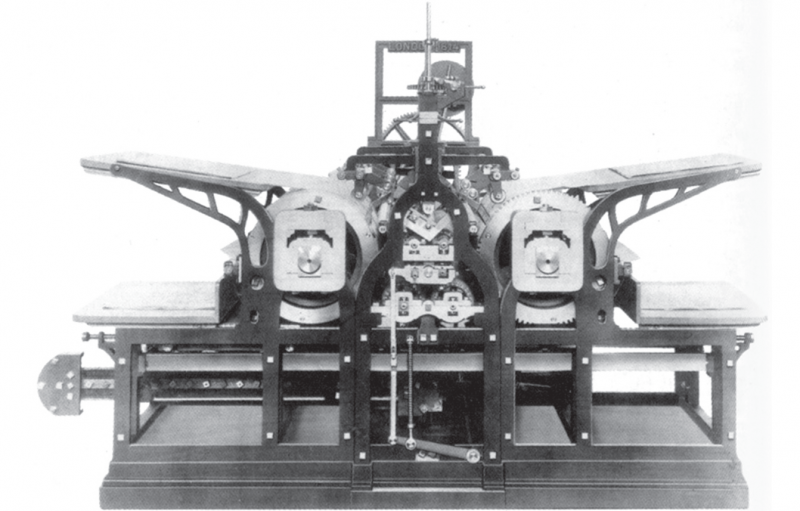 This reconfigured technology greatly improved upon the wooden printing press in many ways. The quality of the type increased because the metal press printed more evenly. 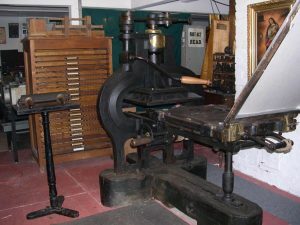 The metal press could also print twice as much in one print compared to a wooden press since the metal created a clearer mark even with a larger plate. This doubling of efficiency greatly influenced the production of the printing press which led to faster output and more pages printed at one time. The metal also lasted longer than wooden presses. Less wear was an advantage for printers because they would have to replace the parts less often. Although this was a great improvement; it still resembled the wooden press more closely than other innovations in printing to come. 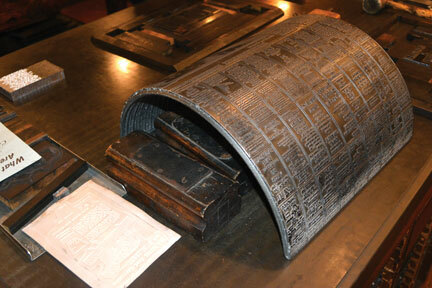 Other adaptations of the metal printing press increased the efficiency of the design. The Columbian press created by George Clymer used levers in the pressing mechanism instead of turning a screw, which decreased the work and increased efficiency. Later, a new device was added to improve the inking process. Samuel Rust created a method of applying ink with automated rollers in the metal press in 1827. The metal printing press was further improved upon by Isaac Adams who used an automated machine, although he was not the first to do so. With the use of steam power, he automated the mechanism for applying ink, and the movement of paper in the press. The ink was applied with rollers and the paper was drawn to the platform of the press, then lifted up to the typeface. Many others adopted and added to this technology. The most well-known of these was R. Hoe and Company of the United States, which was “the leading manufacturer of large presses in the second half of the [19th] century”. As the technology changed and was distributed, the dispersal of printed material also increased. While the metal press was constantly being changed, another type of press which looked radically different was created. design. 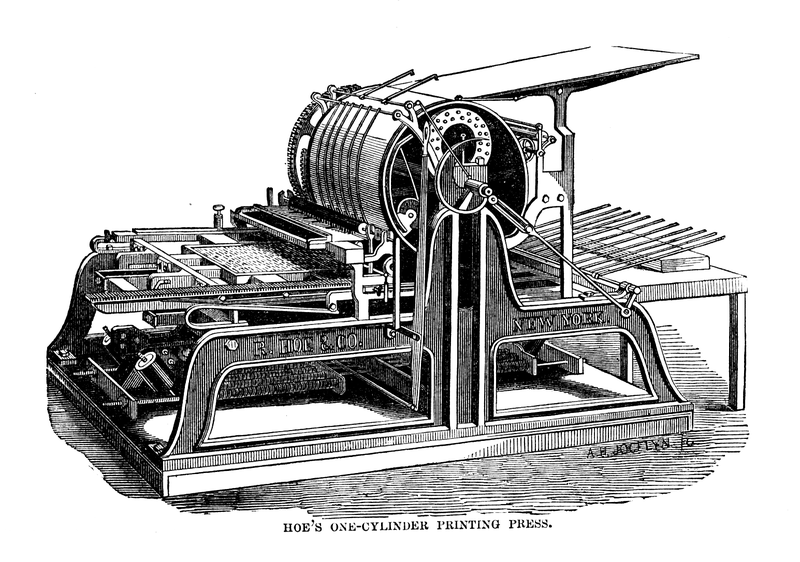 As with the flat printing press, others improved upon Koenig’s design. David Napier used the design in America in 1825. Later it was used by Richard Hoe, who also used double-sided printing. limited by the production capabilities of the printing press. When printing technology improved, newspapers were able to increase their circulation to a larger audience. In fact, “six years after steam-power printing was introduced, the Times had doubled its circulation.” The wide production of newspapers, which was possible because of the rotary press, became a significant part of the culture during this time. In the middle of the 19th century, Sir Edward Bulwer Lytton suggested in a speech that the Times rather than other aspects of society could be a good “memorial of existing British civilization..” The significant innovation of the cylinder steam powered printing press would not have been nearly so important without the innovation of the stereotyped plates. Machines which tried to have type on a rounded surface without the metal plates, such as the rotary press, were not nearly as successful. The process of stereotyping improved efficiency by creating a metal plate for each complete page instead of resetting the type. This allowed for less difficulty in reprinting classic books because the old stereotypes could be reused instead of setting the type each time. The original type was placed into a soft cast, removed, and then the cast was dried or hardened. Then the cast was put in a tray and molten metal was poured over it to create a plate of type. This process took many years to become popular. It was invented by Johann Zeiger in 1696, who used an imprint in paper pulp, dried, it and used it to cast a metal plate. Despite its early existence, it was not readily applied until it was rediscovered hundreds of years later. In 1829, Claude Genoux patented his stereotyping process which also used paper pulp. Later, plaster of Paris, a substance which holds an imprinted shape when hardened, was used as a mold. After a time, electrotyping was invented as a different form of casting type into plates. In this process the plate was created with a softer substance, such as graphite. This material was put into an impression to attract the metal and create the plate. Stereotyping was useful for the cylinder press because the metal plates could be bent around each cylinder, greatly speeding up the printing process. In combination with the new types of printing machines, stereotyping allowed for massive quantities of printing. Unlike other printing processes, which used individual letters of type, plates could be reused for reprinting without resetting the whole page. Unsurprisingly, stereotyping was protested by many people working in the printing industry, especially typesetters. William Ged, a researcher studying the stereotyping process at the University of Cambridge, had to give up his work when the people he was working with halted his work by tricking him. The people who molded letters gave him bad copies, while the people who set up the type and the printers also tried to sabotage his work because they thought it would take their jobs. This is a common aspect of disruptive technology, which often causes disapproval by some of the people working in the industry where it is introduced. Whenever there is a strong movement to a new technology, there are people that long for the previous form. Even today, we sometimes talk about the sentiment attached to getting a hand-written letter rather than an e-mail. The illustrations that went with the type also changed during this time. Three processes were commonly used to produce illustrations: wood engraving, copper plates, and lithography. Wood engraving was created by carving out the wood from the picture to be printed. The white space would be carved away to leave the design. Blocks of wood used for printing were limited to five inches in size, so pictures larger than that had to be printed with multiple blocks fastened together. Copper plates gave sharper clear pictures than wood. For multicolor prints each color would be printed separately. Lithography used stone and pencil to create an area where the surface would not be printed on because of water dispelling the oil-based ink. This process was created by Alois Senefelder. The stone was carved with acid so it could hold water to dispel ink. The ink would cling to the areas of the block with graphite on them. This process required less carving and thus less work to create the plate. Lithography became popular in America starting in 1828, and color lithography was invented in 1837. The use of lithography spread wildly in the U.S. after its introduction. Printed images were important in books, but they were also widely used for business transactions, advertisements, and magazines. The new use of illustrations helped to greatly increase magazine subscription as well as the number of magazine titles. Stereotyping and electrotyping were used for illustrations as well as type, and they were created through the same method. The new technologies of printing created during the 19th century allowed for more efficiency, leading to a wider distribution of materials, including books and newspapers. Although mechanization greatly increased the abilities of printers to produce many more copies of works and, in turn, increased distribution, it was not the only factor in the increase in literacy and the spread of printed works. Other factors such as publishing companies and lending libraries also had great effect on the growth of the book in 19th century society. Louis Dudek, Literature and the Press: A History of Printing, Printed Media, and Their Relation to Literature (1960). Robert Hoe, A Short History of the Printing Press and of the Improvements in Printing Machinery from the Time of Gutenburg up to the Present Day (1902). Ellen Mazur Thompson, The Origins of Graphic Design in America: 1870-1920 (1997). Published by West Oregon University Digital Commons under the terms of a Creative Commons Attribution-NonCommercial 4.0 International license.